A Bootstrap UI kit (or a Bootstrap User Interface Kit) is a library of components and elements (alerts, avatars, buttons, cards, dropdowns, forms, modals, navbars, paginations, sliders, heros, tables, tooltips etc) that use Bootstrap framework as the core. Here is a collection of some of the best Bootstrap 4 UI Kits in HTML format to help you design and develop your Bootstrap web project faster. 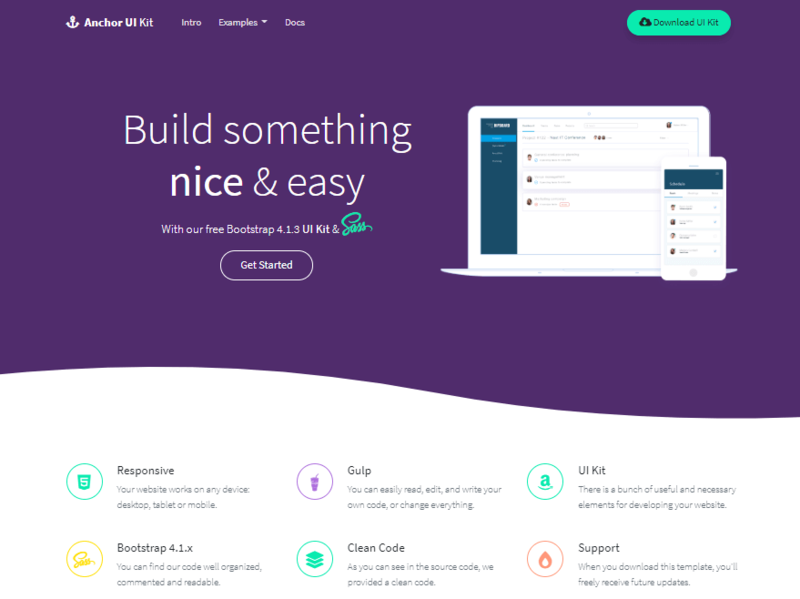 Anchor is a Bootstrap 4 UI Kit designed & developed by us. We’re not biased when we say that this is one of the most beautiful looking Bootstrap 4 UI Kits. It’s best suitable for Sass projects. Anchor has a few ready made examples so you can understand better the look & feel of it: home, sign in, blog, page. Material Design includes 400+ material UI elements, 600+ material icons, 74 CSS animations, SASS files, templates, tutorials and many more. Page examples: About Us, Shop, Sign in, Landing, Contact, Blog, Food Order. Best for: Material Design oriented projects. Flat UI is a free Bootstrap 4 HTML UI Kit based on Bootstrap 4 with a flat design. With Ecommerce - Bootstrap 4 HTML UI Kit you can quickly build responsive e-commerce templates with ready made blocks and plugins. Fire Bootstrap 4 UI Kit includes 99+ handcrafted elements to make your jobas a web designer & developer easy! CoreUI is an Bootstrap Admin Kit. We’ve decided to include an admin KIT and this one looks great. CoreUI includes a lot of unique features and more than 1000 high quality icons. WrapkitLite is Free Bootstrap 4 UI Kit with lots of ready to use sections to build anything like complete websites, landing pages, coming soon, homepages etc. The HTML project of Landio Bootstrap UI Kit is based on the Land.io Sketch design by Peter Finlan. This template and the UI kit were coded by Taty Grassini. Paper Kit 2 is a free Bootstrap 4 UI Kit with light colors, modern typography and clean design. The designers built this having paper and drawings in mind. Any element needed for a web project is already fully coded so you can quickly build your own template. Material Kit is a Free Bootstrap 4 UI Kit inspired by Google’s material design. Creative Tim introduces you to the material concepts with a cool set of components. Along with the obvious restyling of the Bootstrap elements, you can also find three example pages so you can quickly start your next project. Now UI Kit is a beautiful, modern Bootstrap 4 Kit provided for free by Invision and Creative Tim. It features over 50 elements and 3 templates (Profile Page, Login Page, Landing Page). All kits above are great, but our honest recommendation is Anchor Bootstrap UI Kit.